If you buy card kits, do you ever use them up before the next one arrives? Leave me a comment and let me know! I have to admit, I NEVER finish a card kit right away! in fact, I have ones going back to 2014! I think only 2 in that time are all used. So sometimes when I have some time, I pull out an older kit and try to make at least 3 cards with it. I don’t always manage three but I try even if I have to make a simpler card or CASE* one of the cards shown on the insert. *CASE stands for Copy and Stamp Everything, basically using someone else’s design as inspiration but changing it up to make it your own. As long as you don’t pass the card off as your own or try to sell it, you can even copy it exactly! I was in a gold mood when I made these cards. Do you ever get in a mood to use a certain colour, a specific technique or product and use it over and over for a short while? I work in spurts like that. Then I move on to a new one for the next while. This card comes from a Simon Says Stamp kit all the way back from September 2015! I created a ‘background stamp’ using some of the small bows, triangles, circles and half-circles included in the Birthday Bits stamp set. I needed some more bits so I trimmed a couple of tiny shapes off of the small borders. I don’t prefer to cut my stamps apart but these are wonky borders anyway so realigning them perfectly isn’t important. I found a matching ink to the cardstock in the kit and stamped the grouping of stamps I put together on entire card front. Sometimes when I find a grouping I really like, I stamp an example and keep it with the stamp set. 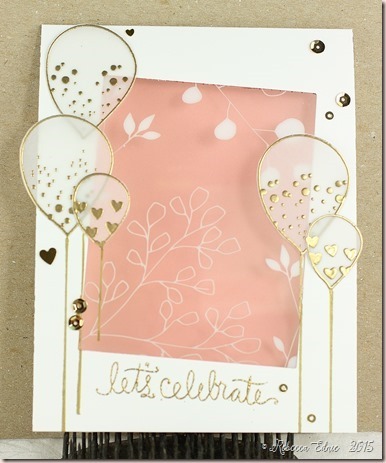 I gold embossed some balloons on two of the papers by Pinkfresh Studio from the kit and on some scrap cardstock. I added some dots on the cardstock balloon. The strings are made of stretch gold cord which is my preference over plain gold string. The stretch means that you don’t have to be as precise when tying the strings together to make sure they all stay straight. I glued the knot to the card with glossy accents using a clothespin to keep it in place while it dried. The sentiment from Celebration Sentiments by Honey Bee Stamps is embossed with gold sparkle powder by WOW. I used banner dies by PTI but I trimmed the points so they weren’t so long. In keeping with the gold theme, I made this card using the October 2015 Simon Says Stamp kit. 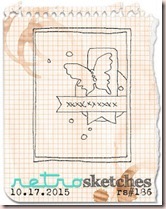 The center panel is one of the journaling cards included in the kit. The cards and the patterned papers are by My Mind’s Eye, one of my favourite paper companies. The panel underneath has a gold-leafed I applied over Scor-Tape, then I rounded the edges to match the journaling card. I hand cut the balloons because the dies I have are too large. I added the same gold cord but this time decided to allow the strings to hang to the side whimsically. It’s hard to tell from this photo but the ‘Let’s Celebrate’ sentiment is gold foiled. 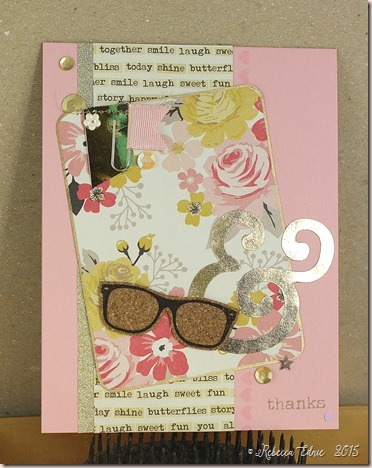 A few gold confetti bits from Studio Katia finished off this card. Thanks for joining me for these fun cards. I’d love to hear how you use your card kits. Do you subscribe or just buy a few here and there? Do you buy more than one? If you get any other than the MFT, SSS or Hero Arts ones, let me know which ones and how you like them! I’m dying to sub to the Spellbinders ones but I only have so many $$$! For my second week hosting over at Crazy 4 Challenges, I decided we should make shaped cards. Anything other than a plain circle, rectangle or square. I had lots of ideas but then I realized I’d already made this card that I loved! When I made it, I was experimenting with some new supplies. The Rebecca Lace background from Simon Says Stamp and some gorgeous new Daniel Smith paints. If you like to watercolour, you MUST get yourself some professional paints, just a few at a time, when they are on sale. Preferably Daniel Smith ones. They truly are amazing! I also finally got myself a few Silver Brush watercolour brushes. They are soooo much better than the ones I’d been using. I had a variety of brushes from value lines from Curry’s to expensive ones from Michaels (coupon baby!) and even some from the dollar store. I’ve always wondered how someone could paint something then come back to the first part and add pigment when in my world, that paint would already be dry! Well, it’s because Silver Brushes hold an enormous amount of water! Oh, now I get it! That’s how their paint is still wet! Such a revelation! The colours I used here were Amythyst Genuine, yes, the actual gemstone is used to make the paint, Duochrome Oceanic which is an aqua with gold shimmer in it, Rhodonite Genuine, Bronzite Genuine, Prussian Green and Cobalt Teal Blue. Most of these are shimmery which looks so amazing with the platinum embossing powder I used to emboss the lace image. I used multiple layers of the same powder to colour my Thinking of You die cut. The stamp is actually square but I decided I preferred it trimmed into a scalloped circle. I hope you have some awesome ideas for shaped cards. If you join us over at the C4C blog, don’t forget to come back here and leave me a comment so you are entered in my giveaway! I LOVE making spinner cards. Some require a lot of detailed and difficult measurements and cuts. They can be worth it but I think the best ones are the simplest. This one requires almost no planning and no measuring! All you have to do is cut or die cut 2 symmetrical images or shapes, sandwiching a thin cord or two strands of thread in between using strong adhesive. Next cut a window in the front of your patterned paper. Then layer your patterned paper on your cardstock and die cut the cardstock layer too. Use some temporary adhesive or washi tape to hold it together if you need to but don’t permanently adhere it together. Once the window is die cut, take apart the layers. Again using strong adhesive, lay the thread or cord on the cardstock as shown. Lastly, adhere the patterned paper down. Now for the fun part! Before placing the card in the envelope, twist the image around about 6-8 times. Don’t over twist or your thread might pull from the adhesive and get a bit slack. I’m not usually into the little cutesy faces but the paper was adorable so I figured the coffee cup should match! I’m quite late jumping on the feather trend. I like feathers but I’m not a huge fan or anything. But I’ve seen so many fabulous cards by many talented designers that I had to give them a try. I used a ton of paper packs for this card, 5 in total! I also used a sketch but it’s long since closed. 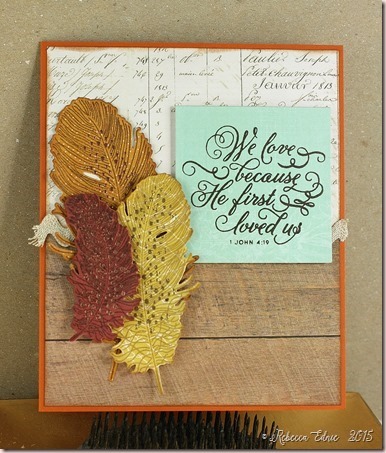 The die cut feathers were die cut then stamped using my MISTI tool. I coordinated the inks to match the papers and used three different metallic embossing powders. Freestyle collage is fairly new to me but I try! I think some of the journaling cards in the last SSS kit are so fun and lend themselves to this style. 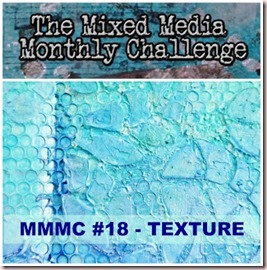 I used more mirrored cardstock in the upper left corner of the journaling card. It looks green because it is reflecting a colour from the background. Try to disregard that will ya? I made the little paper clip flag using self-adhesive ribbon which made it so easy! Paper: DP, &, card-My Mind’s eye, Card base-blushing bride-SU! 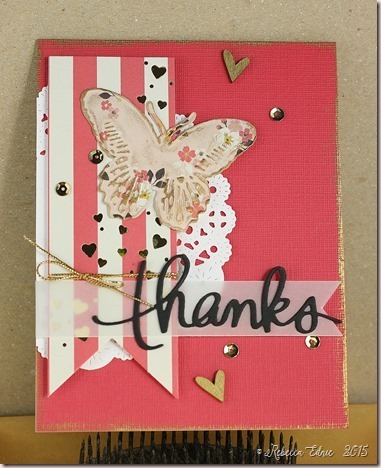 I always make a card using my Simon Says Stamp card kit when it arrives. Or at least i try to!! This time I wanted to use the acetate windows but I was kind of stumped how to use them. This window is the prettiest shade of pink too! It looks reddish at first but it’s really lovely against the white cardstock. The balloons are stamped on vellum with Versamark and gold heat embossed. The window was cut with Nestabilites rectangles and I also cut a liner sheet so the acetate would be sandwiched in between the two layers. that way the adhesive won’t show. For the balloons I hid the adhesive behind the gold embossed lines and dots. I used very tiny drops of Matte Medium which has a strong hold even in small quantities.